All Race Registrants and Lottery Applicants are required to carefully read all pages on this website, as well as this FAQ page. I’ve finished 10 races and won’t race this year. Do I need to register or pay a fee to maintain my priority status? What are the race divisions? Who is a priority racer? Who is a veteran racer or has 10-year status? Where’s my lottery application info from last year? Why does the race registration collect emergency contact information? Why do I have to pay to enter the lottery or to select the Skip-a-Year option? If I am selected in the lottery, can I give my race spot to someone else? Is the race safe for my child and how old do they have to be? If I don’t get in by lottery or lost my Priority Racer Status, what can I do? What year did the top 225 finisher rule get adopted? I’ve finished 10 or more adult races and plan not to race this year. Do I need to register or pay a fee to maintain my priority status? If you have completed 10 or more adult races you do not need to register, nor pay a fee, nor do you need to use the skip-a-year option. Your priority registration status will be maintained. Because of the environmental impact that would result from uncontrolled use and the risk of injury from crowding on the steep and narrow trails, the number of runners is restricted to 350 Men, 350 Women, and 300 Juniors (150 Boys and 150 Girls). Junior Racers: Entrants must be at least 7 years old and under 18 old on July 4th. Boys and girls race in the same race. Adult Racers: Entrants must be at least 18 on July 4th. Men and Women race in different races. Veteran racer is the term previously used to designate a person who has officially completed 10 or more Mount Marathon adult races. The term 10-year-status is now used because it more accurately reflects the designation is not confused with the US military term veteran. Junior race finishes DO NOT apply to 10-year-status. 10-year status gives a registrant priority status. Beginning in race year 2014, the Lottery selection process began using a new, weighted formula, increasing the odds of winning a lottery place in the race, based on the number of times you have applied. The Emergency contact information provided must be someone who can be reached on race day and is familiar with you and the race. Emergency contact information is required for registration for a variety of reasons. If a racer is injured on the race course the emergency medical service providers will use this information to reach the contact. Emergency contacts are contacted when junior racers do not reach the Cut-Off checkpoint before the cut-off time. Additionally, if we cannot reach the racer by phone, we will call emergency contacts for racers who pick up their bibs but are not recorded as starting or finishing the race. 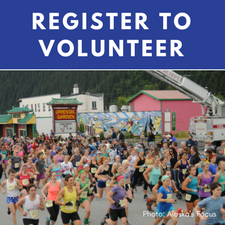 The Mount Marathon Race® is put on by the Seward Chamber of Commerce each year. While we have numerous volunteers who donate their time to make this event happen, it is still a costly endeavor and we rely on entry fees to offset the cost of the race. The runner’s gear (bib with embedded timing chips, and finishers items) and awards are only a part of the cost. We are required to carry Special Event Insurance before we can put on this event. In addition, the race requires timing services, audio speakers and announcers, electricity, porta-potties, waste removal, and specialized equipment. There are also costs associated with the race registration process, maintaining the web site, and tracking the race results from year to year. All these costs are in addition to other services (rescue services and communications gear, for example) that are generously donated. We try to minimize the cost of applying as much as possible therefore, lottery applicants are charged a reduced rate during the application process. Applicants selected in the lottery will be notified by email, and then remit an additional fee via PayPal by April 30th. Absolutely not. If you are selected to run through the application and lottery process, the bib number assigned to you belongs to you and only you. If you find that you are unable to participate in the race, you can not designate another individual to run in your place, nor can the Chamber open your spot up for another applicant. Please refer to the section about bandits. You are required to sign a waiver liability form on your child’s behalf, which may cause you some concern. The race course is challenging, even the Junior portion, which does not summit the mountain, however the trail is routinely climbed by local Seward residents of all ages. The volunteers along the trail are very encouraging for all the juniors and really boost their sense of accomplishment as they progress along the trail. Your child will likely return down the mountain caked with mud, probably scraped up, and may have torn their clothes. Only you can determine whether or not your child can handle the physical challenge, and we encourage you to hike the trail with them several times prior to race day. Junior Racers must be at least 7 years old on July 4th to run in the Junior race. If you have a very small child, keep in mind that all Juniors start the race together, so you may want to encourage your smaller child to begin the race near the rear or sides of the pack. Options for younger racers include the Mini-Marathon race, which takes place after the Womens race, or an older child may want to volunteer to help out with one of the associated events – if they sign up with us early, they can get a volunteer t-shirt! You won’t be the first, nor the last. The majority of slots are allocated through the application and lottery process, so your options are limited. If you are an adult, you may participate in the auction on July 3rd or you can purchase raffle tickets at $10 each for the opportunity to win one reserved slot. Raffle tickets are sold beginning at 5 PM at the auction venue. Sales close promptly at 6:45 PM. If neither of those options meet your needs, we encourage you to participate in the race as a volunteer by contacting us and be sure to apply for next year’s race on March 1. The Mt. Marathon Race made some major changes to the 2013 adult race application process. The priority registration system used before 2013 was no longer sustainable because the number of priority applicants almost exceeded the available slots which resulted in very few runners gaining entry into the race. The revised priority system opens up about 125 lottery slots. This change also benefits former runners who lost their priority status and want to regain a slot.